Catherine ‘Kate’ Sheppard was the most prominent leader of the very first successful women’s suffrage movement, which won the vote for all women in New Zealand back in 1893. The first place in the world. Sadly, for someone who made such a landmark breakthrough for women, Kate Sheppard is little known outside of New Zealand. 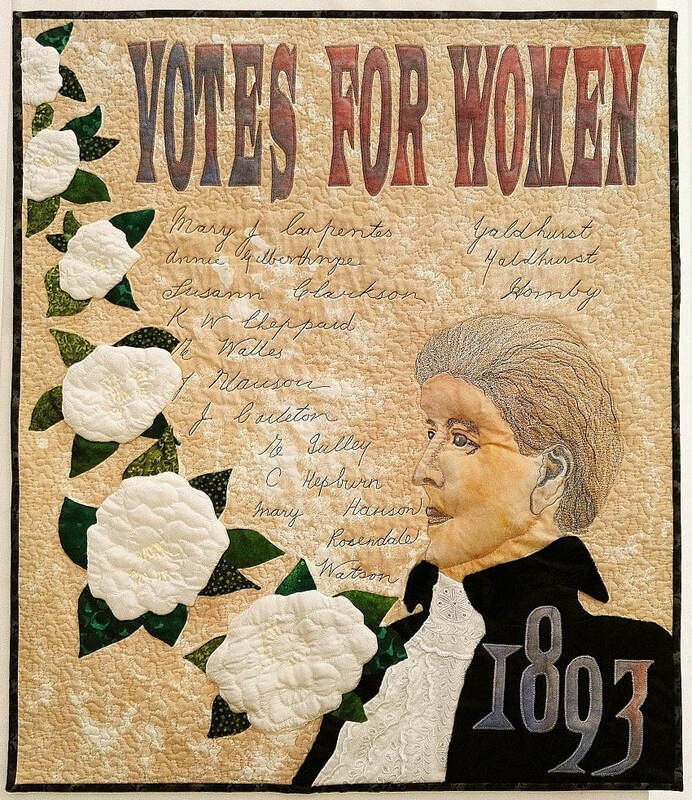 My quilt depicts Kate Sheppard in classic Victorian dress and pose. Although she looks rather severe, she was known for her broad knowledge, good judgement, tolerance and charm. The white camellia flower was worn as a symbol promoting the cause of women’s suffrage throughout New Zealand, so I chose to cascade the blooms down the side quilt. In the centre are the signatures taken from the first page of the famous petitions that played such an important role in gaining women the vote. Kate Shepherd’s signature is at the centre. Just like many other suffragists who followed her lead, Kate Sheppard gave up much to win equality for women, and not just at the ballot box. She was also forthright in promoting the advantages of contraception, the rights of divorce, the equal rights to guardianship of children, and clothing that did not crush internal organs. She was an inspiration to suffragists worldwide who were also striving for the same ends and was a shining example to those governments who had yet to recognise the equal rights of women. We have much to thank her for. ​I also wrote a blog post about how I made this quilt. Click here to read the post.